This recipe is inspired by the region of Piemonte in Italy. Cook and stir bacon in large deep skillet on medium-high heat until crisp, adding garlic for the last minute. Remove bacon from skillet with slotted spoon; drain on paper towels. Discard all but 1 Tbsp. drippings from skillet. Add mussels and wine to reserved drippings; stir. Cover; cook 3 min. or until mussels are opened. Remove and discard any unopened mussels. Add pasta sauce and parsley to mussels in skillet; stir. Cook on medium-low heat 3 to 5 min. or until heated through, stirring occasionally. Prepare using Classico di Siena Fire Roasted Tomato & Garlic Pasta Sauce. 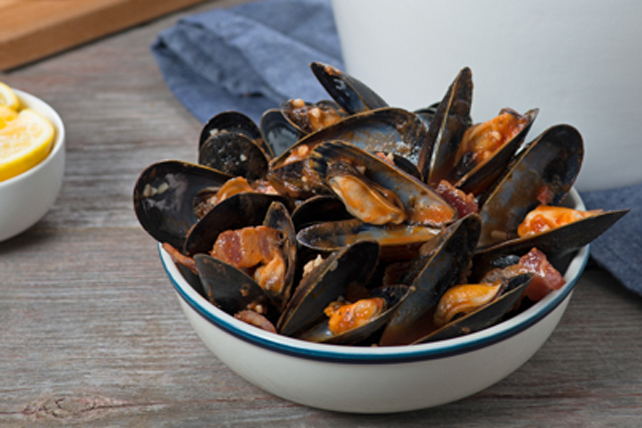 Serve with lemon wedges for squeezing over the mussels. Serve with toasted baguette slices for dipping in the marinara.